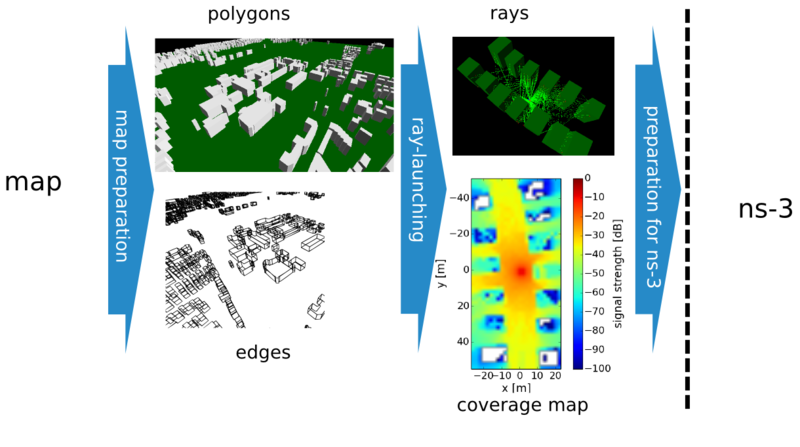 RaLaNS calculates the signal strength distribution for given 3-dimensional maps and may be used either separately or in combination with ns-3 (see www.nsnam.org). It accepts polygon-lists, OSM-maps (see www.openstreetmap.org), or CityGML-maps (see www.citygml.org) as input data. RaLaNS contains viewers for the rays and the signal stength distribution and examples in order to demonstrate both, the usage of RaLaNS and the integration in ns-3. Further information may be found in our papers. RaLaNS is available as open source software under BSD-license. For download links, see below. Questions, suggestions and bug reports may be sent to Thomas Hänel.